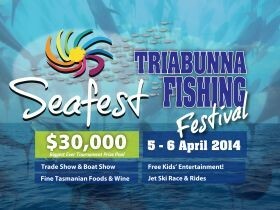 Seafest is a two day festival being held in Triabunna on Tasmania’s East Coast. Festival goers at Seafest can expect to once again enjoy a great selection of east coast food and wine,, boat show,jet ski racing and rides, power boat demos free activities for children. A game fishing competition will take place during the festival. The competition is a sanctioned game fishing tournament held by the Game Fishing Club of Northern Tasmani awith prizes allocated for capture and tag and release. On Sunday 6th April Seafest at Triabunna will be honoured by a visit from the 111 men and women who are riding bikes from Sydney to Hobart. The Tour de Cure message is “Be Fit; Be Healthy; Be Happy” . Between 7am and 9am each day James Tobin of Weekend Sunrise will do live national weather crosses. Important update for Seafest 2013. The festival schedule has been changed and Seafest will not be a 3 day festival this year but will run for two big days instead. Friday 22nd March is Schools' Day and Saturday 23rd March is the festival Community Day. Check out the website seafest.net.au for all the updates!